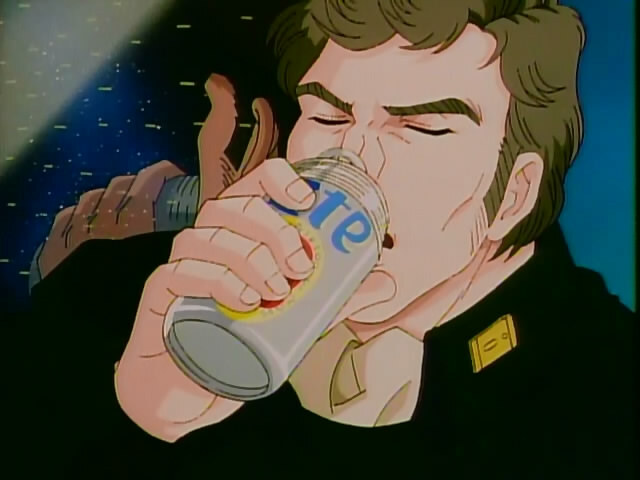 After a long day killing Imperial soldiers, Schenkopp likes to relax with an ice cold Miller Lite. The final episode of this arc ends with the Alliance managing to turn a moral victory into a humbling defeat. Who else but Reinhard would cause that of course. The real story from this episode was a generational one. The Empire relied on its younger commanders to engineer a victory, while the established order in the Alliance rank stood in the way of Yang and his ilk. 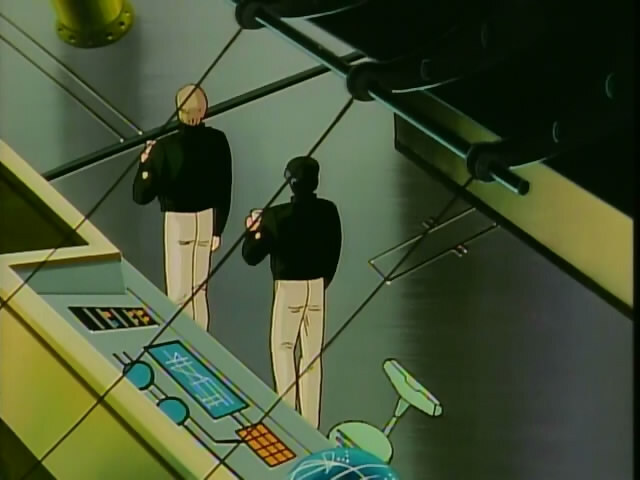 The episode begins as Reinhard recovers from the news of Luneberg’s death, Yang is busy trying to plan a retreat and Cazellnu struggles with logistical demands. The latter two are worried that any sort of tactical genius on the Empire’s side could decimate them, but Cazellnu can only hope that the Empire has been as ruthless at suppressing talent as the Alliance has. Alliance pilots are fueled by Grand Old Parr Scotch Whisky. The episode then takes a different turn with its look at the pilots who fly fighters on the battlefield. Poplan, Ivan Konev and their comrades trade stories of drinking and women between fights. However, the stern fact is that, as the narrator tells us, they all fight a game on the battlefield, and should one come up against a superior opponent in battle they lose their lives. Meanwhile, Yang was actually having some influence in the battle as his ideas on reorganizing the fleet were being directed by Greenhill. However, the commanders at the front largely continued to do their own thing. Reinhard noticed this and absolutely had to go out and do something. 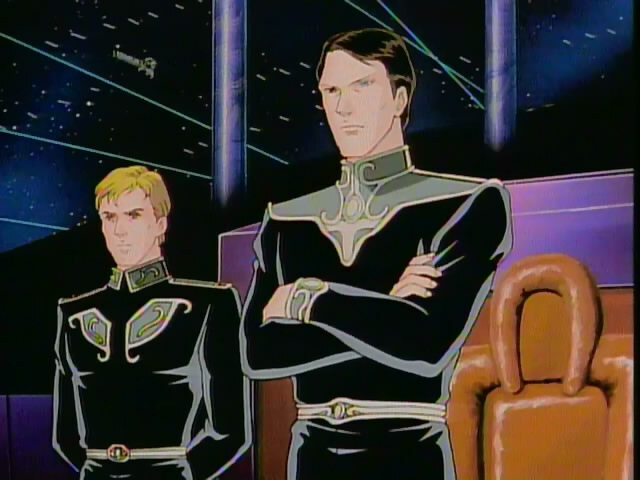 He had Kircheis draft a proposal which was sent to Muckenburger, who was outraged that a subordinate would issue demands. Fortunately for Reinhard he saw the logic in his plan and allowed him to execute it on his own. The Alliance was planning a withdrawal as Greenhill began to suggest using Yang’s proposals for retreat. Lobos initially dismissed them because of Yang’s lowly stature among the commanders, but sensing that he could score a political victory with the numbers as they were, he chose to withdrawal. Then, Reinhard’s fleet of 2000 ships began to move in and acted as though they were cutting off an escape. The Alliance commanders were angered by Reinhard’s fleet and pursued desperately in trying to defeat someone making a mockery of them. Yang sent in another plan to withdrawal through Greenhill, which was turned down by Lobos. In knowing that control was out of his hands, Yang sat back and waited for the worst to happen as Greenhill was also despondent at the situation. Eventually, Reinhard lured the Alliance fleet into the range of the Thor Hammer. The Alliance fleet took massive losses; more than all they had suffered before the cannon strike, and they would have to retreat with their tail between their legs. Funnily enough, Merkatz’s competency in the battle would lead to the end of they Goldenbaum Dynasty, though obviously no one at the time knew that they were supporting the future usurper. Nothing quite tops brandy for celebrating a wretched defeat and future success. 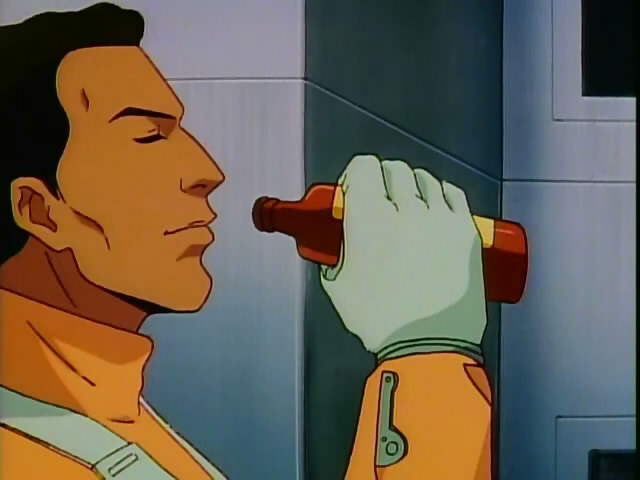 After the battle, Cazellnu could only comfort the increasingly frustrated Yang with the assurance he would be promoted and by offering him brandy. Schenkopp mourned the death of former loves as he ordered Linz to sing a song he hated. While Reinhard seemed frustrated at the outcome of the battle. He was even more enraged when he learned that there would soon be an offensive into Alliance territory only because the losses on the Empire’s side were under 400,000. Thoughts: I believe I’m back into Gaiden 2 territory next week for the final time, but this was probably the first Gaiden arc which really captured what the main series was all about. Reuenthal and Mittermeyer were beginning to make their presence felt in the Imperial ranks, and the Empire was bringing through a golden generation of battlefield talent. The Alliance side could only showcase a different side. They were governed by self-interest, dismissive of new ideas and unwilling to change. I think it’s going to continue for a while yet. In terms of the Gaiden’s cameos, the good thing about this arc’s cameos is that they fit in very well. There had to be somewhere where Mittermeyer, Reuenthal, Bittenfeld and Kempff (you did notice Kempff, right? He was flying a Valkyrie :)) make their existence to Reinhard known. I knew that Valkyrie pilot was someone I should have known. That’s going to bother me now for a while. Heh, well there are no cameos in Third Battle of Tiamat. Unless you count Vice Admiral Ulanhu (10th Fleet Commander in main series, killed in Episode 15 like so many others) and good ol’ Bucock. Third Battle of Tiamat is very much a denouement for the Gaiden, leading into My Conquest Is A Sea of Stars and the main series quite obviously as the last episodes of the Gaiden ever made. Again, its let down by the shoddy Season 2 digital animation. There’s something sad about the last produced episodes featuring the most comical tactics in the franchise. Yeah, i think the worst thing about it is Holland and his ‘tactics’. The guy is just a parody. No one could actually act like that. Raving looney tune. I did like the very end of it though. I know the post won’t be up until tomorrow, but I did see a plausible way he ascended so high. That is mainly the idiocy of his superiors.